Check out these Bitcoin quotes for insight into the thinking of cryptocurrency experts, investors and digital innovators. Blockchain is changing the way currency, finance and governments work. See what the best digital thinkers say about the Bitcoin revolution. 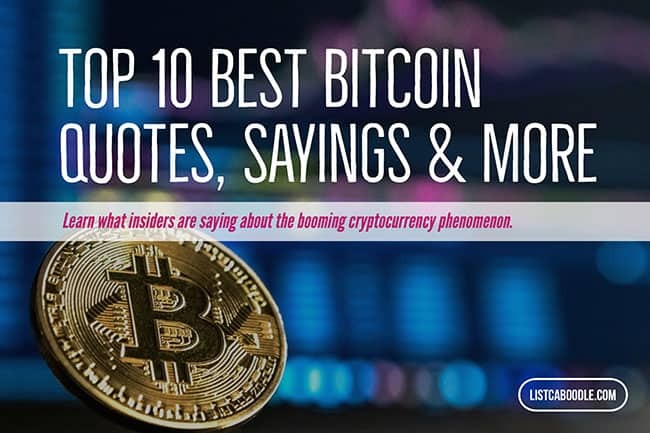 These top ten Bitcoin quotes are from prominent names in technology, finance and politics. They speak of a revolutionary technology—with blockchain at its core—overtaking centuries-old concepts of currency and financial transactions. In their minds, the future of Bitcoin is bright. The rosy view of cryptocurrency is not universal. The unknown and unfamiliar can be daunting. See what these famous names have to say about the Bitcoin revolution and its future. 12 things you should know about the Apple iPhone X.